Under 16 Bluesarrow-rightCreated with Sketch. Tynemouth kicked off on a wind free day for a change, but with a low sun and uneven surface it was never going to be easy. Kingston park settled the better and took the lead when hesitancy between Given and Dickinson allowed the home striker to prod the ball home. The blues began to settle with Alex Smith prominent in the centre of mid-field winning many crucial challenges. Adam Watson was causing all sorts problems on the right wing and with Ben Carr influential in the No 10 role they began to claw their way back into the game. On 15 minutes Liam Anderson cut inside from the left wing and as the Park defenders backed away he rifled a shot into the top corner. 1-1. Ten minutes later a swift interchange of passes between Higginson and Carr saw the latter smash the ball into the net from close range. Kingston Park kept putting the visiting defence under pressure and only a flying save from Dickinson kept the scores level. 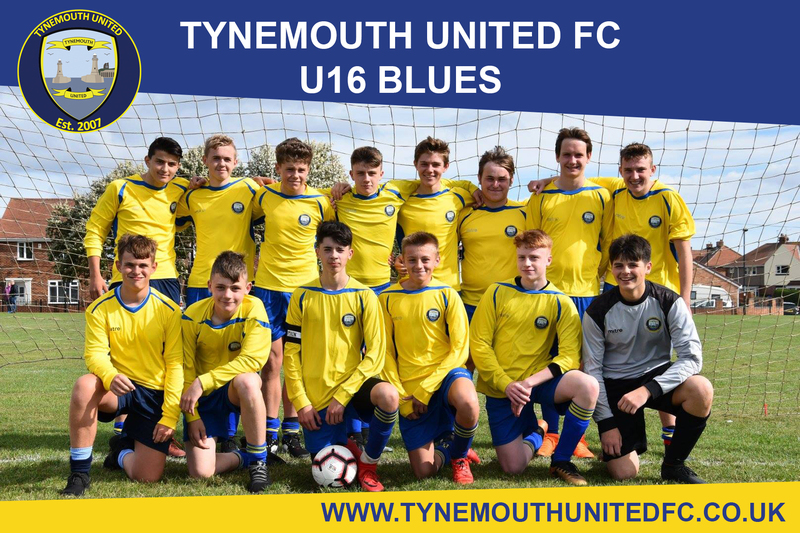 Just before half time Tynemouth took the opportunity to stretch their lead as "birthday boy" Callum Wilson followed up well to strike the ball into the bottom corner. Half time 3-1 Tynemouth. Kingston Park started the second half well and only further excellent work from Smith and Given kept them at bay. Always dangerous on the break Tynemouth added a fourth when Higginson finished well from the middle of the box. Ben Carr quickly added a fifth and Liam Anderson capped an excellent performance with his second to put the Blues 6-1 up and in total control with less than 10 minutes to go. Controversially, Thomas Taylor received a straight red card after reacting to an over the top tackle by a Kingston Park player on one of the Tynemouth defenders by pushing a Park player. Whilst the home player was booked for his tackle Thomas was shown red! As Tynemouth tried to re-group Kingston park took advantage of the situation to score their second goal, however the Blues were to have the last word as Ben Carr completed an excellent hat-trick when he fired his shot into the top corner with the home keeper well beaten. The opposition awarded their MOM to Ryan Higginson with the coaches vote going to Alex Smith for his tireless work in the middle of the park. There were other notable performances from Ben Carr, Adam Watson and Liam Anderson but overall this was a great team effort.